Samson Stage v466 Quad Vocal Wireless System - A Band. Designed for four times the versatility, Samson's Stage v466 Quad Vocal Wireless System let's you 2083e four microphones simultaneo2083ly with a single receiver. 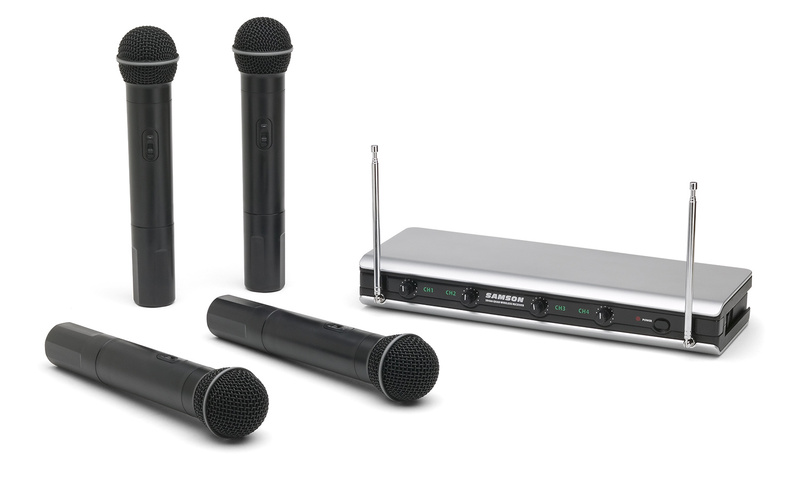 It's the ideal wireless solution for vocalists, karaoke performers, DJs or any application where multiple mics are needed. At the core of the Stage v466 system is a full-rack quad VHF wireless receiver. The receiver's front panel features an RF channel indicator and a large rotary volume knob for each channel. The receiver also offers two tuned antennas, XLR mix, as well as four 1/4-inch outputs that give you the option for each transmitter pair mixed or each transmitter individually. The Stage 4v66 system comes with two 1/4-inch to 1/4-inch cables. The Stage v466 system includes four HT6 dynamic handheld microphone transmitters, each with a Samson H6 dynamic microphone element for capturing clear, accurate vocals. Each transmitter operates for up to ten hours on a single 9-volt battery (four included) and offers a handy audio on/off switch. NETGEAR NIGHTHAWK ROUTER R7300DST-100NAS THIS ROUTER & DST ADAPTER HAS BEEN TESTED & WORKS 100%.